Enpass says 'Full-time' Hello !!! 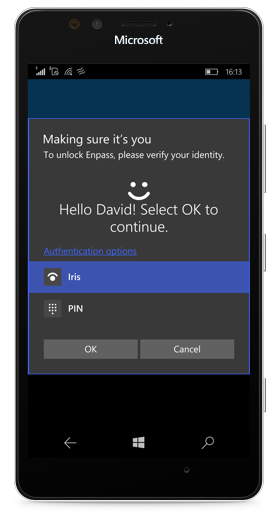 Full time Windows Hello support - Now you can unlock Enpass every time using Windows Hello unlike previous version where it was mandatory to provide master password once the Enpass was closed. TOTP - Enpass is now capable to save and show the Time Based One Time Passwords. Improved Password Generator - Using the Diceware algorithm, Password generator can generate strong and pronounceable passwords in better way. Option for Password History on Details Page. Option to Change Category on Details page. Sensitive fields on Edit page will be displayed by bullets. Scaling issue in large displays fixed. Fixed an issue with WebDAV sync while using self-signed certificates. Option to manually unlock using Windows Hello on Login page. The Beta is available through Package Flight to only those users who has subscribed our Beta Program. You will be prompted to update your Enpass App on the Windows Store. So what are you waiting for. Download it and get your hands on this pre-release version. Please don't forget to highlight the bugs or issues here and keep the dice rolling. I enrolled to the beta program, using the Microsoft email of my account and still see nothing after 3 days. Is there anything special to do on the Lumia ? There were some technical issues with Microsoft Windows Store due to which we were unable to roll out update for Enpass Beta. The issue has been resolved now and we have pushed the update through Package Flight (You might have also got intimation mail from us). It will be available as an update from Windows Store (Might be available to you by now). Changes have been effective and I received the beta update. The always active Windows Hello is HUUUUUGE. This is something that was really bothering me compared to Enpass on the iPhone of my wife with TouchID but now, it is just great. Also, all the other changes are really nice. TOTP is a nice addition (but needs to be handled with care because of the security impact) even if I think I like the iOS nice animation compared to the timer but this is nitpicking honestly. Great great work from Enpass team and now, what i think most people are eagerly waiting is the release of Enpass Edge extension on W10. I am jaleous now that LastPass has released there. Ive signed up for the beta program, but windows store does not update me to the beta version. Thanks for being a courageous member of our beta team . At the moment the stable version is the latest available build and we don't have any active Beta version on store.